When replacing tires or wheels, tire pressure warning valves and transmitters must also be installed. When new tire pressure warning valves and transmitters are installed, new ID codes must be registered in the tire pressure warning computer and the tire pressure warning system must be initialized. Have tire pressure warning valve and transmitter ID codes registered by your Toyota dealer. When the tire pressure warning system is initialized, the current tire inflation pressure is set as the benchmark pressure. Park the vehicle in a safe place and turn the engine switch (vehicles without a smart key system) or the “ENGINE START STOP” switch (vehicles with a smart key system) off. Initialization cannot be performed while the vehicle is moving. Adjust the tire inflation pressure to the specified cold tire inflation pressure level. Make sure to adjust the tire pressure to the specified cold tire inflation pressure level. The tire pressure warning system will operate based on this pressure level. Turn the engine switch to the “ON” position (vehicles without a smart key system) or “ENGINE START STOP” switch to IGNITION ON mode (vehicles with a smart key system). Press and hold the tire pressure warning reset switch until the tire pressure warning light blinks slowly 3 times. 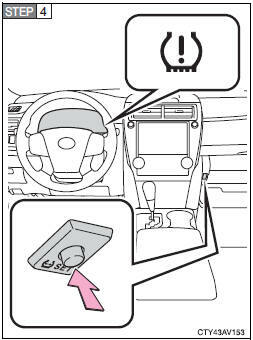 Vehicles without a smart key system: Wait for a few minutes with the engine switch in the “ON” position and then turn the engine switch to the “ACC” or “LOCK” position. Vehicles with a smart key system: Wait for a few minutes with the “ENGINE START STOP” switch in IGNITION ON mode and then turn the “ENGINE START STOP” switch off.